Need some weekly theme ideas? 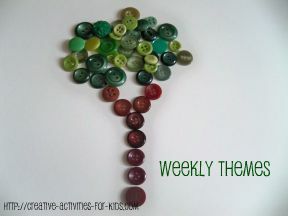 Having a weekly theme for your kids helps nurture their creative spirit, and keeps your kids interested in learning. There is nothing more exciting when finding a theme that really captures your child's interest. Having weekly themes during the summer and all year round is a great way to keep things interesting. Once you have the theme, you base the rest of the week around it. Here is my list of tried and true themes I have used over the years. These work great for kids of all ages! The weekly themes work great for planning your summer. I start planning for each theme a week in advance, of course sometimes I wing it! I try to pre-plan to figure out what supplies, if any I will need, so I am not running out to the store constantly. I find that the beginning of the week is a good time to take a trip to the library or book store to collect books based on your theme. For the cooking portion I figure that part out when I make my grocery list, so we have everything we need for that. You can make these a day, week, or month long theme. I let the children's level of interest decide that.